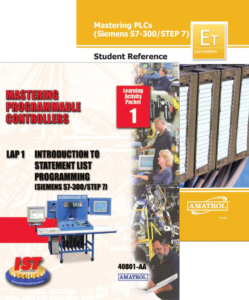 Amatrol’s PLC Statement List Learning System – Siemens S7300 (89-SL-S7300) adds to either the PLC Troubleshooting Learning System – Siemens S7312 (890-S7312B) or the PLC Troubleshooting Learning System – Siemens S7315 (890-S7315B). The PLC Statement List training system provides an introduction to the Siemens Statement List (SLT) programming language, which is one of the three programming languages available in the basic STEP 7 software package. STL is the native language of Siemens S7-300 and S7-400 processors. Users will learn the basic layout of the Program Editor in STL view, how to convert between STL and Ladder Logic (LAD) views, how to view information in a large project, how to monitor an STL block, and how to edit an STL network. The PLC Statement List training system includes a student learning activity packet set, instructor’s guide, and a student reference guide. The curriculum is also available in an optional eBook format with enhanced features like keyword searches and zoom controls that enable users to quickly locate and view information.